Tattered and Lost EPHEMERA: Getting a cold? COULD BE CONSTIPATION! 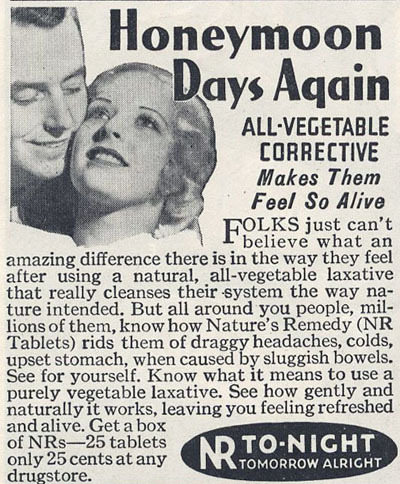 Why are the constipation ads in the back of the magazine? Why aren't they on the inside cover? We're embarrassed by constipation. We're embarrassed by the opposite of constipation. Why am I talking about constipation? 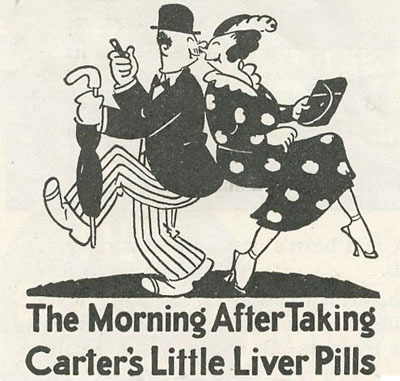 Because there are all these fine ads in the back of the May 1937 The American Magazine. This company, Pluto Water, we've visited before. They had a lovely little gazebo. When I'm constipated my first thought is of gazebos. Okay, better gazebos than this fella. Again, I'm feelin' a little tightening going on. And I don't know why, perhaps it's the 10 year old in me, but I keep wanting to change the headline to "For Constipation Do As Doctors Do Do." Okay, this is better. A breath of fresh air, wind blowing on my face, bathed in sunshine. Oh wait, that's the bathroom light. I've just remembered I need to take one of these before I turn out the light. And I need to run through the house telling everyone else. Well hells bells, why don't I just canvas the neighborhood? Why keep this to myself? It looks glorious! Seriously? I mean...seriously? Honeymoon constipation? Now I know what to get that bride and groom I need to buy a gift for. I'm sure nobody else will give them this. I like to be original with my gifts. Best of all! Dance baby, DANCE! Dance that constipation away! Nose rubs optional and will actually not help at all when trying to ummmmm...relax your...well, you know. Apparently the cure for Saturday night fever. This was a most irregular post.